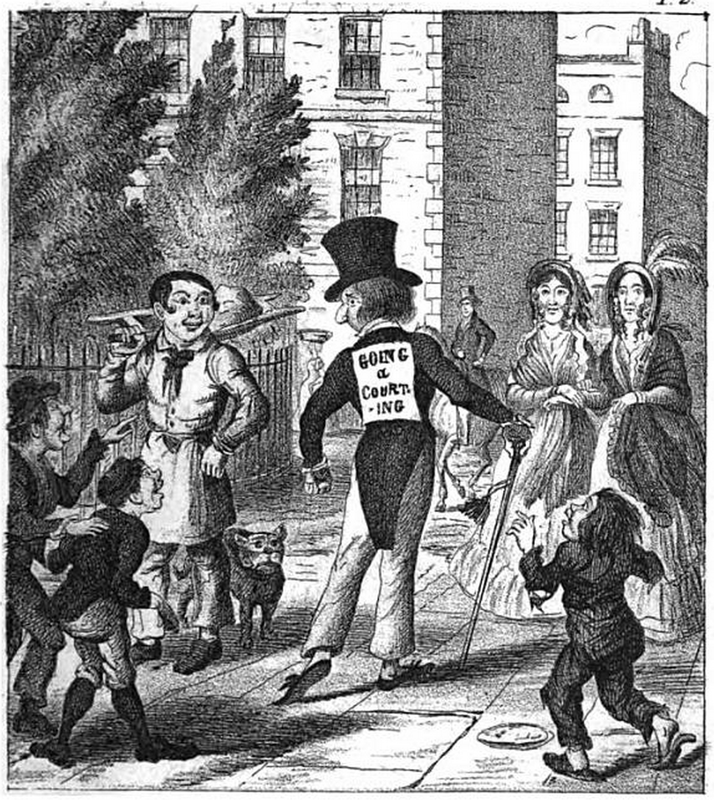 The work of British illustrator and caricaturist George Cruikshank (1792-1878) has appeared many times in this blog (such as here and here.) During his long career, his subjects ranged from notoriously pointed caricatures of politicians and the royal family to illustrations for novels by Charles Dickens, and, later in life, to illustrations in support of the temperance movement. 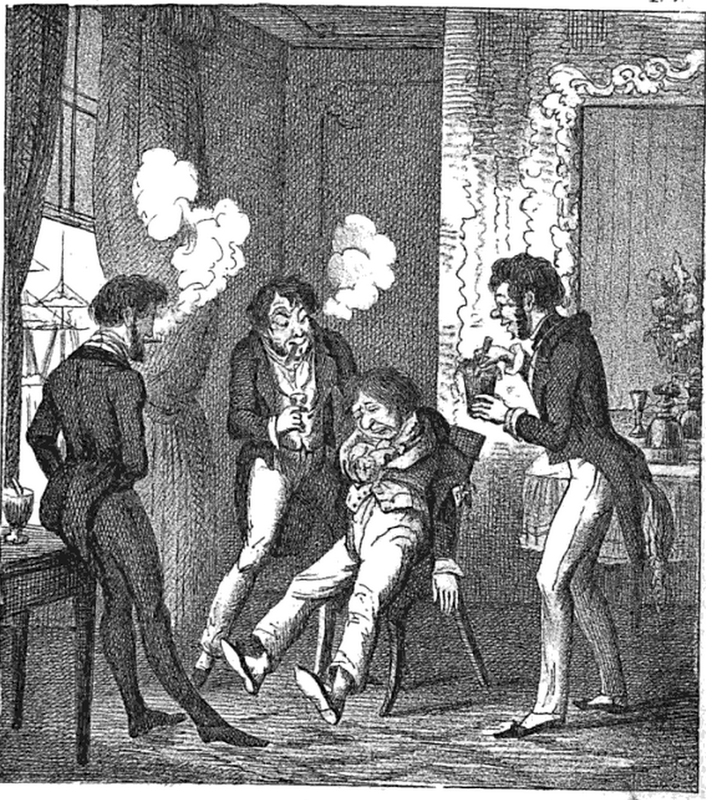 In 1844, he published a small book of twenty-four illustrations that tell the story of a hapless young man-about-town in possession of an inheritance sufficient to lead him into amusing difficulties. The book has an extravagantly long title, The Bachelor's Own Book, Being the Progress of Mr. Lambkin, (Gent. ), in the Persuit [sic.] of Pleasure and Amusement, and Also, in Search of Health and Happiness. From that title, it sounds as if Cruikshank will lead his bachelor down the same dissolute path to self-destruction that William Hogarth - an influence on Cruikshank - did with the young heir in A Rake's Progress. But over-dressed little Mr. Lambkin isn't really a bad guy, and he deserves a better fate. While he does suffer through his share of bad decisions, false strumpets, and strong drink, in the end he realizes the emptiness of his merry life and boon companions. Better yet, he finally succeeds in winning the regard of the future Mrs. Lambkin. One hopes together they did find the happiness mentioned in the title. Here are several of the illustrations, with the droll captions that tell the tale below. 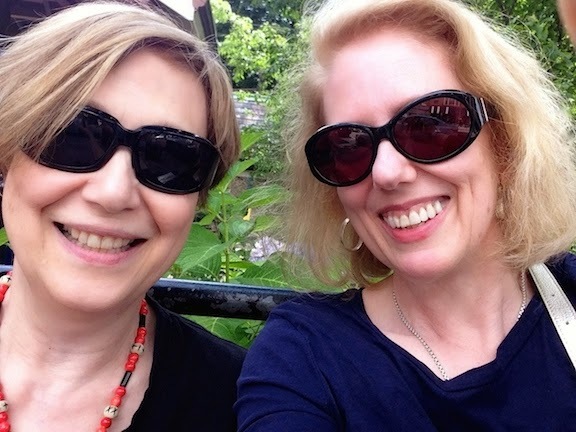 Even better: the entire book is available to read or download free online via Project Guttenberg here. Upper left: Plate 2: Mr. Lambkin sallies forth in all the pride of power, with the secret and amiable intention of killing a certain Lady. Some envious rival makes known his deadly purpose, by means of a placard. Right: Plate 4: Mr. Lambkin suddenly feels rather poorly, something in the "whitebait dinner," having disagreed with him; probably the "water souchy," or that confounded melted butter, (couldn't possibly have been the wine.) His friends endeavor to relieve him with little Drops of Brandy, and large doses of Soda Water. 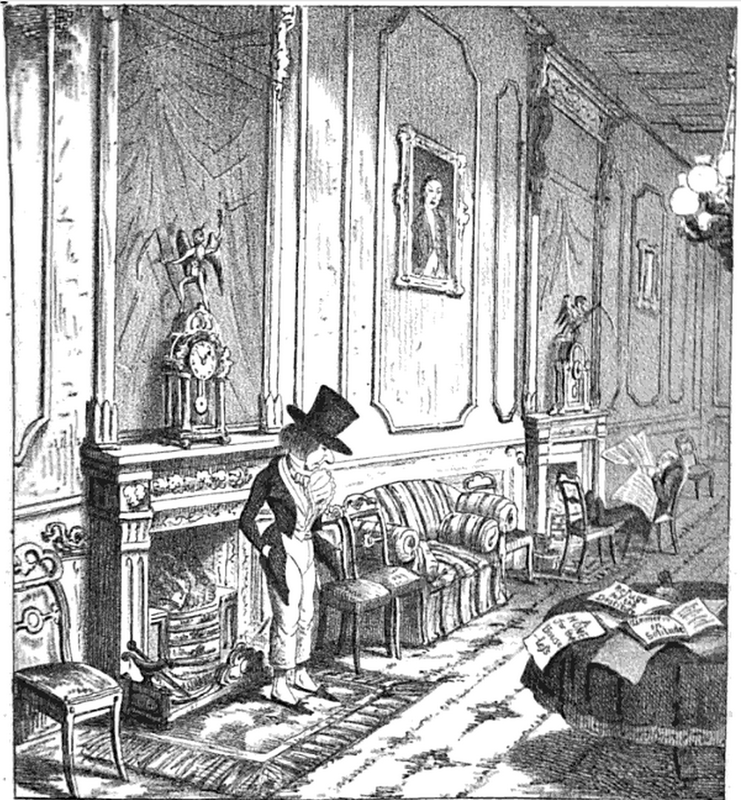 Lower left: Plate 22: Mr. Lambkin being quite recovered, with the aid of new milk and Sea Breezes, determines to reform his habits, but feels buried alive in the Grand Mausoleum Club; and, contemplating an old bachelor member who sits pouring [sic] over the newspapers all day, he feels horrorstruck at the probability of such a fate becoming his own, and determines to seek a reconciliation with the Lady of his Affections. I love Cruikshank's works and am lucky to have some books, with his original etchings in them. Great post!